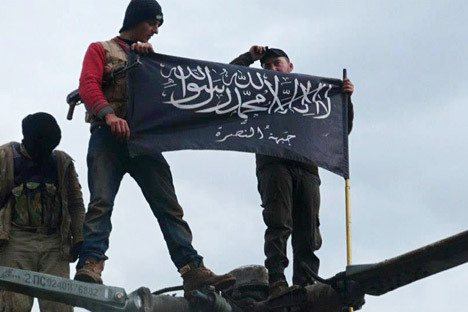 Rebels from Jabhat al-Nusra, also known as the Nusra Front. Three Russian journalists have suffered light injuries in shelling on the frontline of the Syrian governmental army, a representative of the Russian Defense Ministry told Interfax. "On November 23, when a group of Russian journalists was driving towards the frontline of the Syrian governmental army near the populated locality of Al-Dagmashliya, the strategic height of Zuayeq, their cars came under fire of a TOW anti-tank grenade launcher. Three Russian journalists suffered light injuries, and one of them was shell-shocked," the ministry representative said. "The entire group of Russian journalists is back to the Hmeimim airbase; the injured are receiving professional medical aid," the ministry said. RT correspondent Roman Kosarev is suffering from concussion following an attack on a press vehicle in Syria, the television channel's press service said. A report posted on the RT website said an anti-tank missile exploded near the press vehicle, and RT correspondent Roman Kosarev was concussed. According to Kosarev, the missile was fired from the terrorist-held populated locality of Salma.